A multi-tool is one of those undeniably essential items that merits a place in any rider's seatpack. SILCA's Nove is their most compact and lightweight offering, with a total of 9 elements built in. An especially nice touch is the integrated magnetic holder for a spare "missing-link"-style chain connector - just add the connector of your choice and it'll be securely held out of the way ready for action. 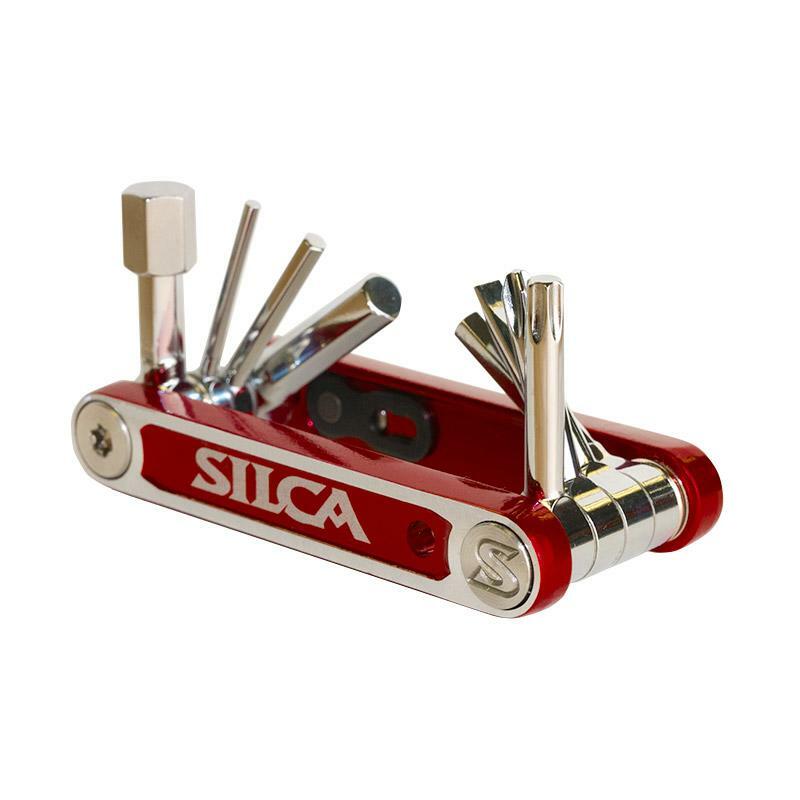 Aluminium side plates help keep the weight down, but SILCA haven't cut corners on durability. Stainless steel hardware and bushings are matched with double-chromed, specially hardened tool steel where needed (forged, for maximum strength). The IAK as we have come to know and love this product combines fully forged mid-length tools with forged aluminum side plates and full stainless steel hardware. The mid-length tool design is long enough to provide access to recessed fasteners, but short enough not to experience twist or damage under moderate torque as experiences on longer tools. All tools are forged rather than bent from hex stock, this method of construction is more expensive, but worth it on the side of the road! Mid length tools also allow us to position the tools within the same plane, this reduces the thickness of the overall package by half. The 8mm is magnetically attached to the 5mm for optimal use of space!